I just finished the fourth book in my ambitious plan to read 25 books this year (for pleasure — I have other reading to do, too). It gives me such joy to say I’ve read a book by a friend! I first met Margaret Rose Realy through an email introduction from a mutual friend. We exchanged some conversations about writing, and a little bit about gardening, and here we are several years later, and I’m reviewing her latest book! 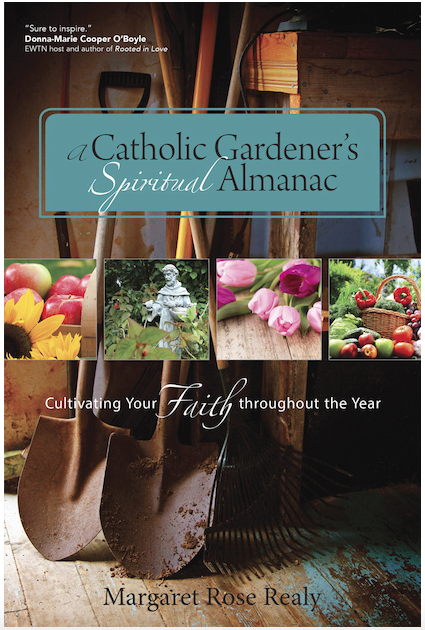 I love this month by month guide that weaves scripture, church history and traditions, with gardening advice into an easy to read and easy to follow manual for growing a beautiful garden. And the garden isn’t the only thing growing, as I find myself reading closely so I can create a space in my yard that complements my faith! I first read Margaret’s gardening advice in her first book, A Garden of Visible Prayer, and fell in love with the idea that working with my hands in a garden could bring me closer to Jesus and Mary by fostering the work of my hands into the work of my heart. The Almanac takes it to the next logical place for me — a yearlong companion on my faith journey. This is a special work by a very special woman. You’ll want this book if you’re a master gardener, or just like to play in the dirt, like me. Read more of Margaret’s insights at Morning Rose Prayer Gardens. You’ll be glad you did. Do get the book! It has plenty of inspiration for a beginner like me.